2003 designation of Church was overturned by the City Council. 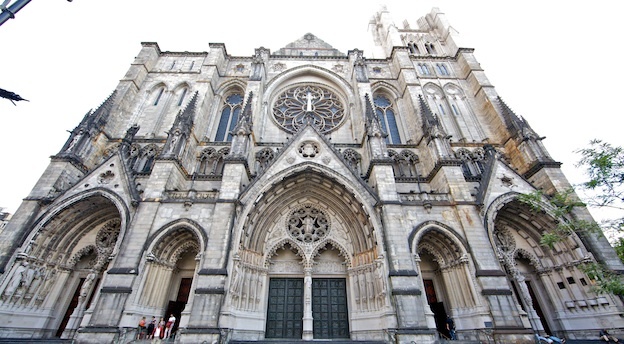 On July 19 2016, the Landmarks Preservation Commission voted to add the Cathedral Church of St. John the Divine and the Cathedral Close to its designation calendar, formally commencing the landmarking process. The complex, consisting of the church and six associated buildings, is located at 1047 Amsterdam Avenue in the Morningside Heights neighborhood of Manhattan. The cathedral is the seat of the Episcopal Diocese of New York. Before the charter of the church, the site complex was occupied by the Leake and Watts Orphan Asylum. One building from the asylum remains, an 1842 Greek Revival-style structure that is the oldest building in Morningside Heights. Other buildings that compose the complex date to the early 20th century, including the Cram-designed Synod House, Deanery, and Bishop’s House. The St. Faith’s House and the Choir School are also included, and both were designed in the Collegiate Gothic style. Together with the cathedral, Landmarks staff said the complex constituted one of the City’s “outstanding ecclesiastical ensembles. The first hearing related to the landmark designation of the cathedral took place in 1966, and the cathedral was finally designated an individual City landmark in 2003. The designation, which was limited to the footprint of the cathedral, was overturned by the City Council. Some Council members voted to reject the proposal because it would allow for the commercial development of two flanking lots that would block views of the cathedral. Council members asked that Landmarks move to designate the entire lot, but any wider designation was opposed by Diocese officials, who argued that funds were needed to capitalize the completion of the cathedral. Development on the cathedral campus remains a contentious issue, as evidenced in a 2014 essay by architecture critic Michael Kimmelman in the New York Times. The Cathedral Close was not de-calendared when Landmarks went forward with the designation of the cathedral. Staff recommended removing the Close from the calendar, and recommencing the designation process with the entire complex together. At the meeting, Chair Meenakshi Srinivasan was for revisiting the designation, “the moment is now,” and added that church was “obviously a landmark-worthy building.” Srinivasan stated that a hearing on the potential designation would take place in November of 2016. LPC: Cathedral Church of St. John the Divine and Cathedral Close, 1047 Amsterdam Ave., Manhattan (LP-2585) (July 19, 2016).